141129 Come run with RUNNING MAN this November! 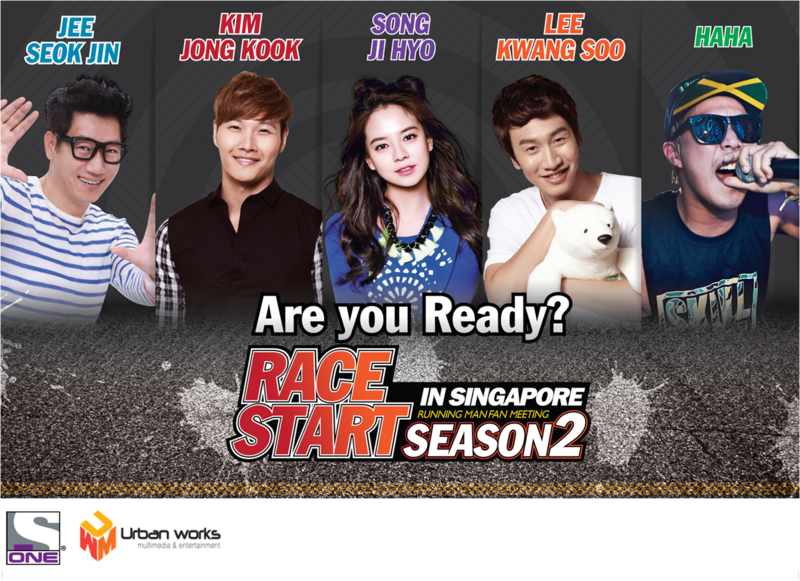 5 August 2014, Singapore – ONE, the home of Running Man in Asia, is delighted to announce the second season of Race Start in Singapore! After the incredibly successful run of the first season last year, ONE, together with the cast of Running Man, is ready to take the region by storm again, starting with Malaysia (Nov 1), followed by Singapore (Nov 29). This year, ONE will gather 5 members from the urban action variety show in Singapore, namely, Kim Jong Kook, HAHA (Ha Dong Hoon), Song Ji Hyo, Ji Suk Jin and the goofy Lee Kwang Soo. The fan meet will mark Lee’s first trip to Singapore with his fellow Running Man crew. Fans can expect nothing less than an amazing night from the dynamic stage presence of the cast and hilarious banter between them. The 2 hour show will include an exciting and riveting mix of comedy and song performances by the singers among them. To make the evening even more memorable, fans will get to win opportunities to share the stage with the stars through interactive and specially tailored games. “Following the resounding success and overwhelming response from last year, we have decided to bring ‘Race Start Season 2’ to a venue with a greater capacity, so more fans of Running Man can be part of the experience,” said Virginia Lim, Vice President, Asian Content, Networks, Asia, Sony Pictures Television. The Singapore leg of the 2014 Asia Tour will take place at The Star Performing Arts Centre on Saturday, 29 Nov 2014 from 7.30pm. Tickets will be priced at $348 (VIP), $258 (CAT 1), $228 (CAT 2), $198 (CAT 3), $168 (CAT 4), and $148 (CAT 5). VIP ($348) ticket holders will receive an exclusive autograph pass, where they will get an opportunity to meet the stars up close and personal, and get an autograph from one randomly picked Running Man cast member. More details on the meet-and-greet session will be made available in due time. Race Start Season 2 in Singapore is proudly presented by Watsons Personal Care Stores, with Official Sponsor OWL Coffee, Official Mall Suntec City and Supporting Sponsor Allswell. For the latest updates on ‘Race Start Season 2 in Singapore and Malaysia’ of the Running Man Fan Meeting Asia Tour 2014, stay tuned to ONE on SingTel mio TV channels 513, 604, 514, 605, StarHub TV channels 820, 823 and 124; log on to the ONE website (www.onetvasia.com); or follow the ONE Facebook page (www.facebook.com/ONETVASIA) and Twitter account (www.twitter.com/ONEtvasia). Fans of popular South Korean drama, Emergency Couple, will be thrilled to know that in addition to the exclusive fan meet, lead cast members, Song Ji Hyo and Choi Jin Hyuk will meet fans at Square 2 on 15 May 2014. ‘Emergency Couple’, Choi Jin Hyuk and Song Ji Hyo will be having their fan meet with Singapore fans on 16 May 2014 at the Kallang Theatre! All fans who bought Cat 1 ticket (by 16 May) will get a group photo with Emergency Couple and fans who purchase tickets from any of the 4 categories (by 4 May) will stand a chance to win a hi-5 pass. 100 lucky fans will be chosen (by their seat numbers) to hi-5 with the stars. The hi-5 session will be held on the 15 May, 8pm at Square 2. 1 lucky winner from each ticket category will be chosen for the Emergency Couple Fan Meet backstage tour! Lucky winners will be announced on 2 May, 6pm. What are you waiting for? Hurry get your tickets by 30th April (2359hour) to stand a chance to win! Priority ticket sales (only for SingTel Mio TV subscribers) will start on 12 April (Saturday), 12pm, at all SISTIC outlets. Public ticket sales will start on 13 April (Sunday), 12pm, at all SISTIC channels.